Christians and Government | Byron Howell Ministries, Inc.
Today we see our Nation's political landscape torn apart by strife. You all know the issues that our leaders fight about every day. For our Nation they are all important, and these battles' outcomes will have significant and far-reaching consequences. We know that America now has what some call the "Christian Right." But many Christians align themselves with left-wing ideologies and causes. I wish we could all look at the Bible together, and then vote and debate accordingly. But unfortunately it's not that simple. While I look at a passage and reach one conclusion for my political stance, another could read the same passage and reach the opposite conclusion. I believe Christians are to obey the Bible. I don't believe we have to argue with it, debate about it, or (skeptically) question it. I believe we are to read it and follow it. When Romans says that we are to subject ourselves to the higher powers, then we are to do it. When 1 Timothy says we are to pray for those in authority, then we must pray. God promises us a quiet and peaceable life in return. If a Christian is sowing anger, strife and rebellion toward our government, then that Christian will "receive to themsel[f] damnation." I didn't write it, I just believe it. And I hope people will receive this message and look after their own welfare and the Church's duty. The disturbing trend is that these days so many Christians speak out against the government in strife and rebellion, personally attacking our leaders and constantly complaining about the institution as a whole. You can vote however you feel led to vote. You can petition and poll and write and call and assemble and do everything else our wonderful Constitution allows us to do. But when you come together in a rebellious party spirit, or when you let that rebellious party spirit attach itself to you, you are in the flesh and out of God's will. You can't tell me that this negative energy isn't of the devil. Moreover, if those politically motivated Christians would spend half that energy winning souls and advancing God's kingdom, then they would undoubtedly be making serious headway for the cause of Christ in the Earth. So what do you do, especially when abortion deaths increase and homosexuality continues receiving greater governmental approval? You pray. The effective, fervent prayer of a righteous man availeth much. You pray for the President. You pray for the judges and leaders. You (gasp) give thanks for them. You pray for God's will to be done in the Earth. You vote how you believe you should. If someone asks your opinion, you should give your Bible-based thoughts on the issue, but never openly deride or criticize our leaders. Consider what Voltaire wrote in Candide, published 250 years ago, "I would be enamoured of the freedom inspired by English genius, if passion and partisan spirit did not corrupt all that is estimable in this precious liberty." Then listen to Paul, nearly 2000 years ago, "Use not liberty for an occasion to the flesh, but by love serve one another." My fellow Christians, my political opinions and passions run deeper than you would ever imagine given this posting. But I believe God calls me to love and pray for those who govern me, regardless of their ideas or plans. We have liberty in this Nation, glory to God. But we must not allow it to stir within us strife and rebellion. Those are not of God. There is a fine line between Godly resistance and sinful rebellion. The Holy Spirit will help you not cross it. Love all people, pray for our Nation. If God leads you into politics, wonderful, He will use you to accomplish what the rest of us pray for. Finally, I believe the Bible only allows us to specifically break two types of laws: those requiring worship of anything other than God, and those forbidding our worship of the One True God. I don't know of any such law in the U.S.A. Should such a law arise, we will need to discuss this again. Until then, pray and obey. Trust God. 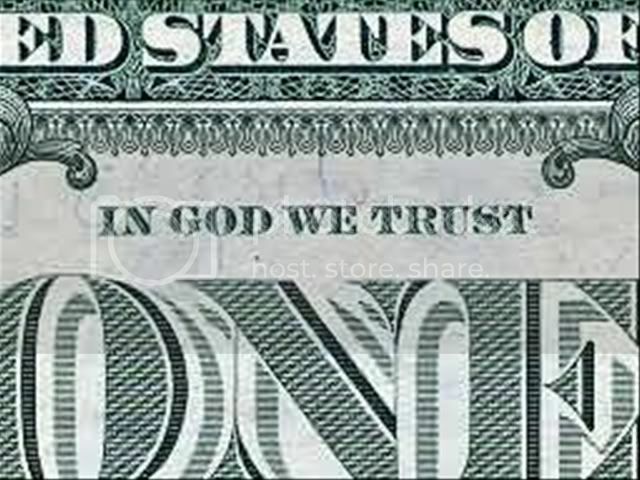 Regardless of whether some godless politicians remove "In God We Trust," from our money or motto, we must always trust Him and His Word concerning our hearts toward our government, and we will always be "One Nation, Under God."